The Bulletin is an editorial-based monthly magazine, which is mailed to all active member physicians. It is the most efficient and effective way to reach PCMS member physicians. With a visually appealing format and robust with information, the Bulletin is an invaluable resources for area physicians. The content consists of topics relevant to the medical practice and business side of medicine, as well as legislative updates and member profiles. To receive a media kit or request more information, contact pcms@pcms.org or call 515-288-0172. The Bulletin is the official publication of the Polk County Medical Society. Published bimonthly, the Bulletin is mailed to all active member physicians. The Bulletin includes regular features on local health care news, medical society news, physician profiles, and practical advice for the business of medicine. 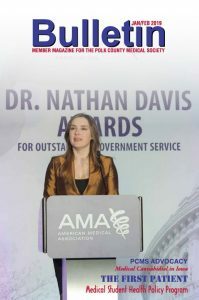 Semi-regular features include legislative updates, feature medical updates by members, president’s message, executive director’s message, doctors in the news, travel, current photos from PCMS networking and civic events. We welcome contributions to the Bulletin from member physicians! If you have a topic of interest or an article submission, please contact Paula A.Noonan, managing editor. We evaluate contributions from non-members on a case-by-case basis.